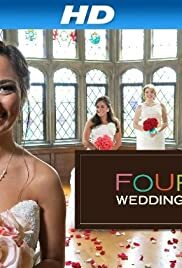 A show about four women who compete against each other with their weddings to win a honeymoon. TISWAS Police 5 Shaw Taylor Credit Reference. I Morine Barnes have watched Four Weddings with envy as my marriage was disastrous. Entourage of jealous people wanted it and got it. I blame myself naive. I Morine Barnes is divorced from my children Myola and Rommel dad Donald Edwards money desertion. Donald passed away on the 20/05/07 drugs related we are bereaved. Donald found love with Michelle Stewart son Clinton who he wants. I learnt my lesson that is marriage once bitten twice shy . It is the same again marriage not for me. There is someone for everybody I have not found the right person.I Morine Barnes pay my bill planner up budget benefits off work sick with Depression and ends do not meet with a job debt. Morine Barnes 58. Donald 59, Myola 37 & Rommel Edwards 35. Graham 90.